Welcome to Yukon Wound Care and Rehabilitation House Call. Making a trip to the Emergency Room, hospital or physician’s office is stressful enough for healthy individuals, let alone seniors with multiple chronic conditions. Appointments often require a family member or caregiver to take off work, and pose a potential injury risk. Our team of specialists provide outstanding at home wound care and rehabilitation to meet your unique needs. Please contact us for more information on House Call Services. 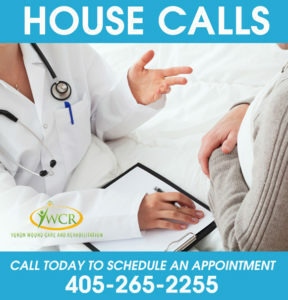 House Calls are provided within a 15 mile radius of Yukon, Oklahoma.